Last month the Oregon Employment Department had a great article on Recreational Vehicle Manufacturing workers that deserves a little more attention. Written by Brian Rooney, Regional Economist, the article examined workers who were employed within the RV industry before the Great Recession (2007q3) and then tracked them in the Unemployment Insurance wage records to see where they are now (2011q3). The RV industry has undergone a major structural change in Oregon (and nationally), so while the severity of the changes is somewhat unique to the industry in the state- although not unlike Wood Products historically – I believe the results are broader in nature and can be used to illustrate the trends and challenges associated with switching industries (or careers) and income. I would like to thank the Oregon Employment Department, in particular both Brian Rooney and Barbara Peniston, for their help and also providing the underlying data behind the original article. Any errors are my own and not those of the Oregon Employment Department. [From 2005 to 2008]… the industry was relatively stable, staying between 6,000 and 7,000 jobs. During the following severe national recession that lasted from late 2007 to late 2009, RV manufacturing was hit hard as credit died up, investment returns declined, and jobs were lost. The result was a drop in demand for many products including RVs. RV manufacturing employment dropped to 1,610 by April 2009, a loss of 79 percent from its peak. We know from the industry data that many relatively high-skilled and high-paying jobs were lost. 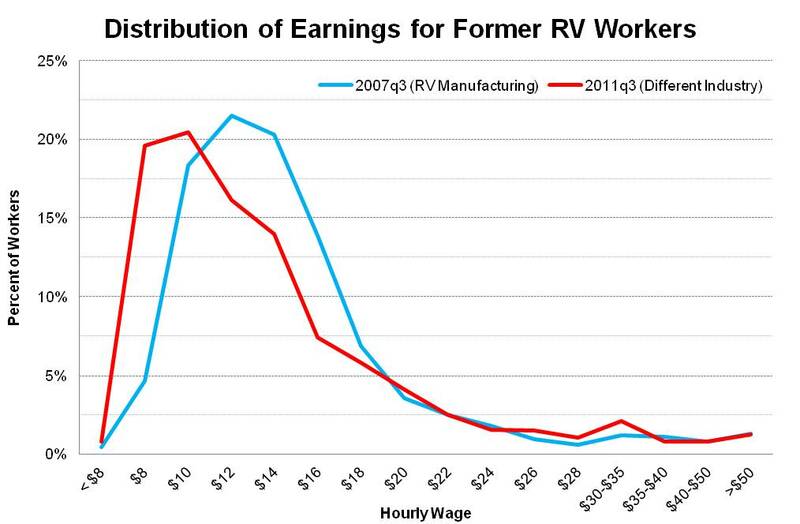 But what happened to the workers in the RV manufacturing industry as a result of the recession? Were they able to regain employment in the industry? Were they able to transition to other industries? Did their earnings decline or grow? The Employment Department was able to track these individuals in the UI system and find out which industries they currently work in, what their wages are and how many hours they work. Their findings, shown in the graph below, indicate that 12% percent of the RV workers from 2007 are still currently employed within the industry, 52% are currently employed in Oregon but in a different industry and 36% of the 2007 workers were not found in the UI system. This last group is most likely composed of individuals who are unemployed or moved out of the state plus others that are now employed in jobs not covered by the UI system or even retirees. I want to focus on that middle 52% – the workers who currently have a job in the state, however in a different industry than RV Manufacturing. While it is unknown exactly what percentage of these individuals left the industry voluntarily – for a different job, for personal reasons, etc – or were laid off – probably the largest share – their results are likely indicative of broader trends. As discussed in more detail in the article, these workers are now employed in a variety of other industries. The largest of which is, not surprisingly, other manufacturing industries (1,006 workers, or 27% of the reemployed workers), however nearly half of the reemployed workers transitioned to a service-type job in Professional and Business Services, Retail Trade, Educational and Health Services or Leisure and Hospitality. That’s all well and good, however what did this industry change mean for wages? Unfortunately the majority of workers ended up taking a pay cut in their new jobs relative to their old RV jobs as shown in the graph below. Specifically 64% of these workers saw a wage reduction (median decline: $3.37 per hour) while 34% saw a wage increase (median gain: $3.09 per hour). Effectively, the relative share and income for workers earning $18 per hour or more remained the same – even if some individual workers moved between the groups – however for all the workers earning less than $18 per hour, there is a clear shift down in terms of wages. This result is not unexpected and is generally intuitive as workers switching industries have less experience in the new field – even if it is still manufacturing – and certainly less experience with the new employer, both of which usually result in lower wages as experience, and in particular firm level experience, is generally a significant factor in determining pay. So what are the general implication of this? For one, switching industries, especially mid-career or for more experienced workers, is challenging and results in productivity losses and wage reductions. This is certainly the case at first, however once a worker gains experience in the new industry, hopefully both their productivity and wages increase again. Second, the manufacturing industry as a whole – where wages tend to be pretty good or at least supportive of middle wage or middle class lifestyles – has been shrinking in Oregon for the past 14 years, even with a couple years of gains last decade, and largely for over 20 years at the national level. Based on recent history, once these jobs are lost, they tend not to reappear or certainly not to the same degree as they were lost. Transitioning out of manufacturing and into service oriented work, which tends to pay less on average, presents its own challenges for both the workers (income loss) and the economy overall (productivity loss). Finally, even with retraining programs available these industry changes will take time, especially for changes that require substantially different skill sets. For example, only 311 of the former RV workers are now employed in the Educational and Health Services industries which have continued to grow throughout the Great Recession. Even if a worker wishes to move to a growth sector like Health Services, it takes time to retrain and add the skills necessary to be a competitive applicant for the jobs. While I just wanted to highlight the wage changes associated with job/industry transition/loss, I would recommend reading the whole article as it is very informative. When you mention that once lost, these jobs don’t tend to return I am wondering about the latest job numbers. Job growth in the past few months has been the highest it’s been since before the recession (according to the news reports I’ve been hearing). Has the RV Manufacturing Industry been reflecting this? And if so, have former RV Manufacturing employees been rehired, or have the new jobs been going to people transitioning from outside of the RV Manufacturing Industry? I’m curious about the fluidity of jobs in a recovery. Thanks for those great and important questions. Job growth in Oregon since the end of the recession has been pretty slow yet steady once you smooth out some of the large month to month movements. 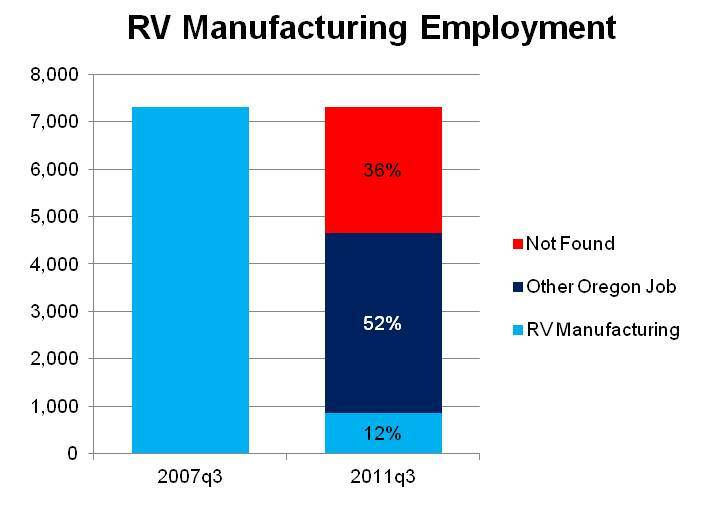 RV Manufacturing is part of the Transportation Equipment sector, which has added about 1,000 jobs since the depths of the recession (from 10,000 to about 11,000 today) which makes for strong growth in percentage terms (10%) however prior to the crash the industry employed about 18,000 workers. In terms of the transitioning of employees it takes a lot of work to track employees through the system and the Employment Department only does so on a periodic basis. I have not seen another update along these lines since I used their hard work on the RV industry. That being said, we have seen in this recovery a big difference in terms of long-term unemployed workers. You can define those as workers out of work longer than 6 months, typically, and they are at their largest on record (data going back quite a few decades but not to the Great Depression) both in terms of the overall number of individuals and as a percentage of all individuals. This is certainly a concern from an economic perspective since – generally speaking – skills begin to erode when not being put to productive use thus making the long term unemployed cycle a little bit more self-fulfilling. Hope that helps, please let me know if you wish to discuss further. Thanks for responding, Josh. It’s a pretty complicated situation, and your response just helps make that more clear.